Overall we were very pleased. There was some issues with my having pre-paid the tips and NCL not seeing that. I spent an hour on hold during my vacation trying to get it cleared up and am still arguing with Expedia and NCL I brought my family including my 77 yr old mother for a holiday cruise. She is very mobility restricted so we got the handicap room for her and it was perfect. No stepover for the shower and ramps for the balcony made her experience so much nicer. We ate in all specialty restaurants during the week and it was fabulous. Special shout outs for eating on the waterfront as the sun was setting, really made my cruise. We had adjacent aft facing cabins 9322 and 9922. My favorite spot on the boat was on those balconies. The beds were super soft and our room steward was always going the extra mile for us. We didn’t do any excursions (mom), but we did check out all the ports at least a little. Cozumel is always pretty fun, lots of stuff to shop for and do. Harvest Caye. “the private island” was a joke. It looked great but everything costs cash and the cruise ship was only a thousand feet away. We used the pool and went back before lunch and used our drink package on the ship. Costa Maya was super touristy but still fun. My wife and I checked out the Aviary, lots of cool birds up close. 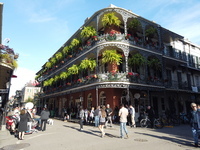 New Orleans is all you have ever heard and more. We stayed there three days before and after, and I would have liked to stay even longer. The shows were great as well. I enjoyed Rock of Ages, even if the Lonnie character was way to stereotypical (hint to actor, we aren&apos;t supposed to know he is gay). The Pour House was also great with rock and roll shows featuring several vocalists who kept the energy high. Balcony of 9622, Look at the size of that thing! 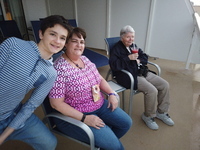 I brought my family including my 77 yr old mother for a holiday cruise. She is very mobility restricted so we got the handicap room for her and it was perfect. No stepover for the shower and ramps for the balcony made her experience so much nicer. We ate in all specialty restaurants during the week and it was fabulous. Special shout outs for eating on the waterfront as the sun was setting, really made my cruise. We had adjacent aft facing cabins 9322 and 9922. My favorite spot on the boat was on those balconies. The beds were super soft and our room steward was always going the extra mile for us. We didn’t do any excursions (mom), but we did check out all the ports at least a little. Cozumel is always pretty fun, lots of stuff to shop for and do. Harvest Caye. “the private island” was a joke. It looked great but everything costs cash and the cruise ship was only a thousand feet away. We used the pool and went back before lunch and used our drink package on the ship. Costa Maya was super touristy but still fun. My wife and I checked out the Aviary, lots of cool birds up close. 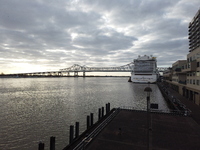 New Orleans is all you have ever heard and more. We stayed there three days before and after, and I would have liked to stay even longer. The shows were great as well. I enjoyed Rock of Ages, even if the Lonnie character was way to stereotypical (hint to actor, we aren&apos;t supposed to know he is gay). The Pour House was also great with rock and roll shows featuring several vocalists who kept the energy high. What a scam. While it looked nice it was just a place to spend money for things that are free a thousand feet away onboard the ship.